Satellite Images Show New Construction at North Korea’s Plutonium Production Reactor; Rapid Restart? A 38 North exclusive with analysis by Nick Hansen and Jeffrey Lewis. North Korea has begun new construction at a plutonium production reactor located at the Yongbyon nuclear complex that may be intended to restart the facility shut down under a 2007 agreement. A key step in that process will be to restore the disabled secondary cooling system. Fans blow carbon dioxide on the reactor core to cool the 5 megawatt electric (MWe) reactor. The secondary cooling loop provides water to remove heat from the gas. Under the 2007 Six Party agreement to disable facilities at Yongbyon, North Korea agreed to cut and remove portions of steel piping of the secondary cooling loop outside the reactor building and to remove the internal wood structure of the cooling tower. North Korea subsequently agreed to demolish the cooling tower in 2008 to provide the Bush administration with a “striking visual” that would symbolize the disablement process. Rather than construct a new cooling tower, North Korea may simply connect the secondary cooling system to the pump house built for its new experimental light water reactor (ELWR) which is located adjacent to the old reactor. 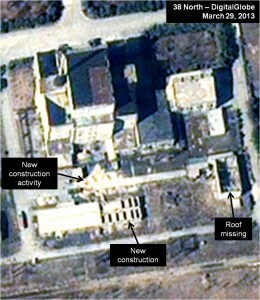 The “copy” of the Yongbyon reactor that North Korea was constructing in Syria before it was destroyed by Israeli warplanes in 2006 also used a pump house instead of a tower to provide secondary cooling. North Korea may connect repaired pipelines that run underground from the 5 MWe reactor to those coming from the new pump house constructed by the river to supply the ELWR with water. Rebuilding the destroyed cooling tower may have taken as long as six months but utilizing the cooling system from the ELWR may significantly reduce the time necessary to restart the 5 MWe reactor to weeks rather than months. One key factor that would affect this estimate is the availability of fresh fuel rods for the reactor. Once operational, the 5 MWe reactor is capable of producing six kilograms of plutonium per year. Whether it can continue that production indefinitely depends on the fresh fuel rod supply. Figure 1. 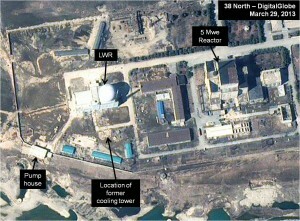 No activity at the 5 MWe reactor at Yongbyon on February 7, 2013. Figure 2. 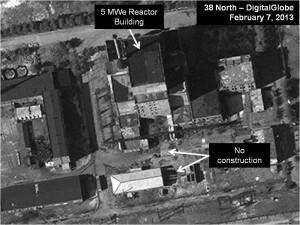 New construction at the 5 MWe reactor at Yongbyon on March 29, 2013. Figures 3 & 4: Cooling pipe system (November 13, 2012 & March 29, 2013). 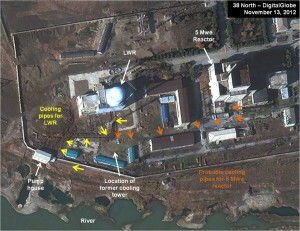 In 2010, Sig Hecker stated that North Korea could restore the piping in the secondary cooling loop without constructing a cooling tower, something that “could be done in days to a week.” See: http://www.armscontrol.org/act/2010_11/NKReactorWork.